Take Interstate 81 South into Maryland and then take Exit 6A, which is Route 40 East. Turn right at the first traffic signal onto Western Maryland Parkway. Go through the roundabout at W. Washington Street and take your second right, staying on Western Maryland Parkway. Proceed approximately one mile and as you pass Tandy Drive on Western Maryland Parkway you will see the Sheriff’s Office complex on your left. Take Interstate 70 West to Interstate 81 North. Proceed on Interstate 81 North to Exit 6A, which is Route 40 East. Stay in the exit lane and turn right at the traffic signal onto Western Maryland Parkway. Go through the roundabout at W. Washington Street and take your second right, staying on Western Maryland Parkway. Proceed approximately one mile and as you pass Tandy Drive on Western Maryland Parkway you will see the Sheriff’s Office complex on your left. Take Interstate 81 North into Maryland and then take Exit 6A, which is Route 40 East. Stay in the exit lane and then turn right at the first traffic signal onto Western Maryland Parkway. Go through the roundabout at W. Washington Street and take your seond right, staying on Western Maryland Parkway. Proceed approximately one mile and as you pass Tandy Drive on Western Maryland Parkway you will see the Sheriff’s Office complex on your left. Take Interstate 70 East to Interstate 81 North. Proceed on Interstate 81 North to Exit 6A, which is Route 40 East. Stay in the exit lane and turn right at the traffic signal onto Western Maryland Parkway. Go through the roundabout at W. Washington Street and take your second right, staying on Western Maryland Parkway. 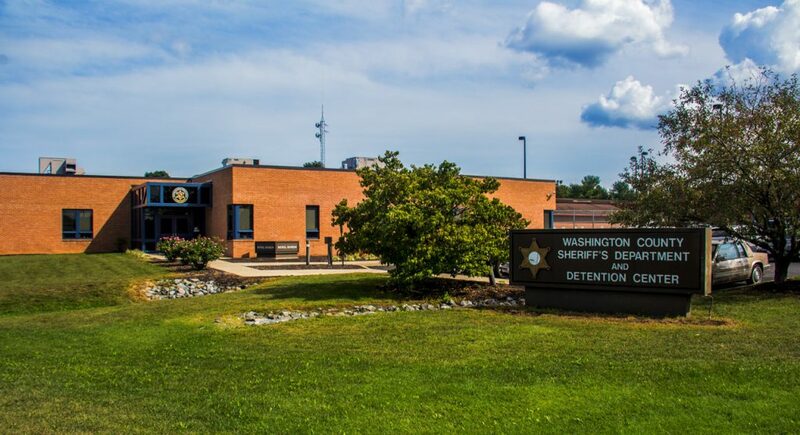 Proceed approximately one mile and as you pass Tandy Drive on Western Maryland Parkway you will see the Sheriff’s Office complex on your left.